I’ve never labelled myself as a gamer because the few times I did that early on, I was laughed at when I told folks that my addictions were series like Need For Speed, Colin McRae Rally & Rallisport Challenge. While the NFS series of games (specifically NFS II SE) made me lust after the McLaren F1, the Subaru WRX STi was my steed of choice when I got to play rally games. Moving to the US to study firmed up my love for Subarus even more. And when I got the chance to buy my 1st car soon after graduating, I found myself at a Subaru dealership in Delaware, lusting after a used Impreza WRX STi in the classic World Rally Blue Pearl color with gold wheels.. However saner minds prevailed (a used STi is almost always a bad idea considering the fun that 1st owners tend to have with it!) I chose a single owner, 1st gen Impreza which the dealer told me had been driven by a lady who had it serviced only at the dealership. Whether that was true or not, my burgundy/red ‘95 Impreza was a solid drive. Though it was the last model year before Subaru’s famed AWD became standard, it gave me almost 3 years of fun until I saved up enough money for a new car. 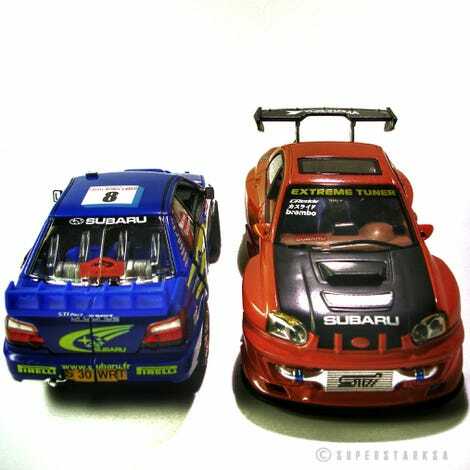 The orange Subi is a 1/24 scale Impreza S202 STi Wrx Red Widebody modified tuner JDM Turbo from the KenToys brand. Am not a big fan of the SEMA style modded cars, but this was a early addition to my collection, picked up from a seller in a street fair in Delaware. The other blue STi, of similar 1/24 scale, is from Hasbro and Takara. But he has a dark side. I will leave it as a mystery for now and put up a separate post to lift the Smokescreen! Hehehe.